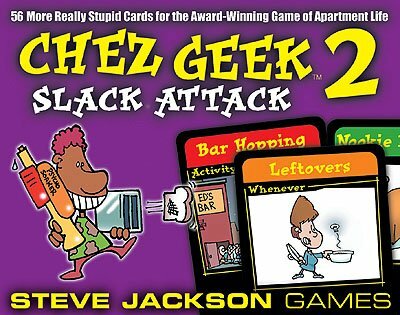 Chez Geek is the award-winning card game that throws open the door on apartment life - the cheap booze, the interrupted sleep, the shrieks of your roommate's S.O. Now add even more stress to your living situation with Chez Geek 2: Slack Attack. This 56-card expansion adds new stuff, new activities, new annoying "friends" - and, yes, new nookie! - to the ever-important quest for Slack.